Heat oven to 400°F. Spray 12-inch pizza pan with cooking spray. In medium bowl, stir Bisquick mix and very hot water until soft dough forms; beat vigorously 20 strokes. Press dough in pizza pan, using fingers dipped in Bisquick mix; pinch edge to form 1/2-inch rim. Spread pizza sauce over dough. Sprinkle with cheese. 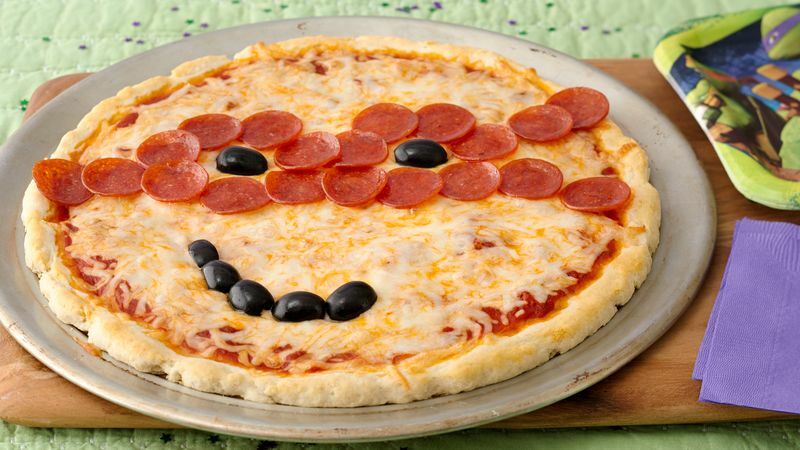 Place pepperoni slices on pizza in mask shape, overlapping pepperoni slightly. Place olive slices in mask for eyes. Bake 12 to 16 minutes or until crust is golden and cheese is bubbly.